Corpus Collusion today introduced a privacy lock for its beautiful writing tool, The Dream Log. Once unlocked, this stylish journal provides six luscious backdrops to inspire imaginative thought and pair with preconscious musings. For both creative writers and dream recorders alike, thirteen delightful chimes can wake users from slumber. 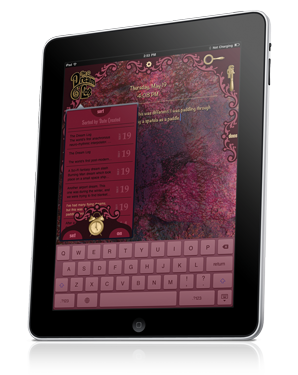 The Dream Log for iPad is available from the iTunes App Store for the surreal price of $1.99. Introduced in June, The Dream Log launched as a 5-star crowd pleaser for its writing environment. Customers gushed: "This app is strikingly well designed. The user interface is minimal, intuitable, freshly eccentric without a hint of superfluous bloat. I wish all application developers would design their user experience with as much precision and attention." … "Unbelievably gorgeous. I am in love." … "This is definitely the best Journal app on the App Store. It's extremely moody, fantastical, and, oddly, atmospherical." Customers also wanted a lock, and Corpus Collusion is proud to deliver a locking mechanism that is gorgeous, easy to use, and powerful. Once a password is set, the mechanism locks whenever the user switches apps, or taps the QuickLock ornament. An immersive animation completes the illusion of The Dream Log as a bound journal. "Corpus Collusion designs software as visually sleek as the iPad itself," said company co-founder and visual designer Vibrata Chromodoris. "The Dream Log locking mechanism integrates seamlessly with the software and feels magical." The Dream Log makes it easy to keep a creative writing practice current. Whether journalling dreams, as consciousness explorers such as Jung recommend, or chronicling the day’s affairs, writing every day is a popular inspirational device in the creative person’s toolkit. Features such as low-contrast themes and an alarm clock facilitate a morning writing practice. "Our customers wanted a lock, and we over-delivered," said company co-founder and architect Kathy Tafel. "The Dream Log passcode screen offers more than 3.65 trillion possible combinations and a QuickLock button for immediate privacy." The iPad makes a perfect writing tool under low light situations; the user need not turn on a bedside lamp. The Dream Log takes this advantage even further. Rather than blasting sensitive, freshly awakened eyes with bright backgrounds, The Dream Log utilizes a color palette of light text against mid-tone colors. These backdrops work well in both portrait and landscape orientations, and are darkened behind the text for legibility. The other interface elements shift to complement the images as the user switches milieus. The Dream Log serves as a 21st century writing tool, taking advantage of modern technology unavailable in a bound paper journal. The user can organize entries by date created or last opened, with calendar days rendered to merge into the background. Each entry keeps its own theme and font choice. Fonts are styled in bold for onscreen legibility, but export in normal weight via email, print, or PDF. Users can share their entries via Facebook, LiveJournal, or Blogger. Corpus Collusion was founded in 2009 to develop smart software for iOS devices — both stylish and ingenious. The Dream Log follows the successful launch of Corpus Collusion's debut app, The Recipe Box. This top lifestyle app is rated 4.5 stars by users and has been featured in The Boston Globe. • Interface widgets complement themes by color. • Set alarm directly by moving clock hands. • Automatically repeats each day. • Pinch-zoom to adjust font size. • Swipe two fingers to turn pages. • Works well with Bluetooth keyboard. • Swipe to delete list entries. • Auto-saves three times per minute. • Sort entries by date created or last viewed. • Select a word to find an interpretation on the web. • Non-roman fonts let you write in your native language.